The fast underground belt is the second tier of underground belts. It has a maximum underground distance of 6 tiles—2 more than the basic underground belt. The speed of the fast underground belt is the same speed as the fast transport belt, which is twice as fast as a basic transport belt or underground belt. 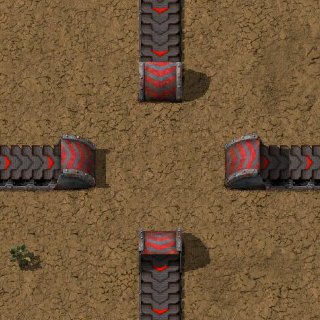 Increased the underground belt length (basic, fast, express) from 5,5,5 to 5,7,9. Underground belts won't connect if underground belt ghost is in the way.